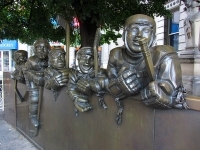 Avid hockey fans should visit Toronto's Hockey Hall of Fame. Within this shrine to Canada's national sport, visitors can learn about the history of the game through memorabilia from every era, hockey artefacts from around the world, themed exhibits, multimedia stations and images of great moments in hockey history. Iconic players' goalie gear, skates and sticks are also on display. Visitors usually relish having hands-on access to the Stanley Cup, and trying out state-of-the-art games that challenge shooting and goalkeeping skills. Opening times: Monday to Friday, 10am-5pm. Saturday, 9.30am-6pm. Sunday, 10.30am-5pm. Admission: C$18 (adults), C$12 (youths aged 4 - 13), free for children under 3. Other concessions are available.